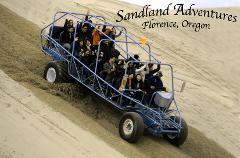 Our custom built Longtravel Sandrails will take 2 to 10 passengers screaming over the dunes. With over 20” of suspension travel and plenty of horsepower, our professional drivers will take you on an exhilarating ride. 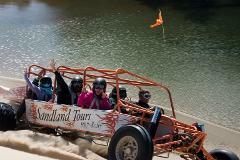 Giant Dune Buggy Tours are a more scenic way to see the Oregon Dunes with a touch of excitement. 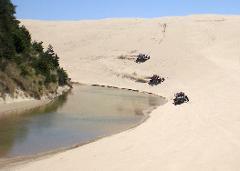 Informative, scenic and fun describes this one hour dune buggy tour covering approximately 8 miles of dunes and 2 miles of ocean beach.